Giant RV is proud to be one of the largest and fastest growing RV dealerships in the nation today. Our Corporate office has been in the same area for over 26 years. With four RV Sales, parts and Service. 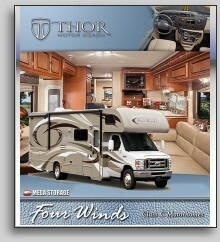 Still setting your sights on a brand new motorhome? Well, get your timing right, and you might just bag yourself a bargain. GiantRV has special financing during our motorhome Sales event for all types of credit profiles and Interest rates are at their all-time low right now! This Sales Event is a MUST for everyone in the market for an RV! Enjoy The simple pleasures of RVing-the outdoors, fresh air, warm sunshine, freedom of the open road, flexible schedule, provide a release from everyday life, put problems into perspective, renew and refresh both mind and body. Giant RV sells many of the top Ranked RV brands in the industry today. If you can't find your "Dream Coach" from our vast selection of 750 units, our Factory Direct order network will ensure you get the exact unit of your choice. Giant RV wants to exceed your expectations at every opportunity and provide you with a buying experience that will encourage you to come again and bring your family and friends. Our main goal with our on-line service is to promote the many benefits of the RV Lifestyle and to help you enjoy that lifestyle to the fullest. Take the comfort and security of your home to the great outdoors and to provide you, our much valued customer, with the best selection of products from America's most reputable manufacturers and offer those products to you at a fantastic price. For further details go to GiantRV you will found our site informative, entertaining, and that you have enjoyed your time spent here.